Home » Causal Research Design Experimentation » Test Marketing Wow! Because the initial findings were encouraging, it was decided to expand the test marketing to Columbus. Ohio, and Indianapolis, Indiana. The product in these test markets was changed in packaging design, price, and the name. called WOW!, which better described the product with its great taste and no- and low-fat/calorie-reduced attributes versus the Max product name used in the initial test markets. The test market results were again positive. Based on favorable results, the decision was made to launch nationally Frito-Lay’s WOW! line of Ruffles, Lay’s, and Doritos chips, all made with Olestra. may be an attractive option. An electronic test market combines consumer scanner panel, store distribution, and house hold level media delivery in designated markets. An example would be services offered by Information Resources, Inc., using Behavior Scan, which combines scanner panels with broadcasting system (see Chapter 4). A virtual test market uses a computer simulation of an interactive shopping experience in three dimensions. Web-enabled test markets involve product tests using online distribution, i.e., the product being tested is offered solely through a dedicated Web site. Because of its lower costs, Web-enabled test marketing is gaining in popularity. It is being used by consumer packaged goods companies like Procter & Gamble and General Mills. Thus. 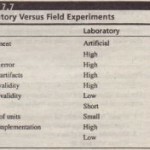 the internal and external validity of field experiments conducted overseas is generally lower than in the United States. By pointing to the difficulties of conducting field experiments in other countries. we do not wish to imply that such causal research cannot or should not be conducted. Some form of test marketing is generally possible. as the following example indicates. It is often necessary to disguise the purpose of the experiment in order to produce valid results. Consider. for example. a project conducted to determine the effectiveness of television commercials for Kellogg’s Rice Krispies cereal. The respondents are recruited and brought to a central facility. They are told that they will be watching a television program on nutrition and then will be asked some questions. Interspersed in the program is the commercial for Rice Krispies (test commercial). as well as commercials for some other products (filler commercials). After viewing the program and the commercials. the respondents are administered a questionnaire. 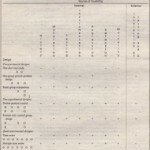 The questionnaire obtains evaluations on the program content. the test commercial. and some of the filler commercials. Note that the evaluations of the program content and the filler commercials are not of interest but are obtained to reinforce the nature of ,he disguise. If the respondents knew the true purpose was to determine the effectiveness of the Rice Krispies commercial. their responses might be biased . As of 2009, Levi’s is a leading global apparel company, with sales in more than 110 countries. It has been a long-standing company with more than 150 years of being in the clothing business. Although one may think this long history can only result in good things, Levi’s heritage has been its worst enemy. John Anderson, the president and chief executive officer for Levi Strauss & Co” had to work to revamp Levi’s antique image and make the brand appealing to younger generations in efforts to boost its declining sales. In the last five years, Anderson saw worldwide sales drop 40 percent, losing market share to competitors like the Gap, and trendier ones such as Calvin Klein, Tommy Hilfiger, and Diesel. Another problem for Anderson came from store brand jean such as JC Penney’s Arizona brand jeans or the Gap’s in-house brand, which have changed their image and launched an assault on Gig brand names like Levi’s. These store brand jeans, along with other store label jeans. now target the teenage market with “cutting edge” advertising. American trade publication Brand Strategy estimated that the brand has lost about 50 percent of the younger consumer market share worldwide between 1999 and 2008. 1. If you were John Anderson, what type of research would you want to conduct to help arrive at an answer? 2. Please explain how you would implement the type of research you have recommended. 3. Discuss the role of the type of research you recommend in enabling John Anderson to determine the power of a national brand like Levi’s compared to an in-house brand like Gap or a store brand like JC Penney’s Arizona jeans. 1. What should Levi’s do to compete with in-house and store brands of jeans?